A little piece of me: Profile Horror! Hello! just a scary picture of me while i figure out how to do a profile picture! i have found that adding a profile photo is harder than i thought. 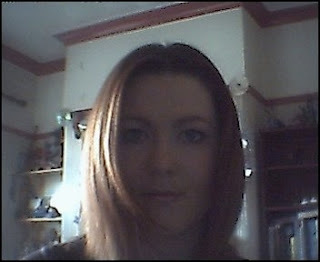 I dont like my photo taken so had to trawl through these scary webcam photos!!!!!!!!!urghhhhh. But as I am training to become a counsellor i thought i should get over this phobia of mine! it may seem trivial, but it really is hard for me. I am dreading when my sister gets married next year and I am a bridesmaid because that means loads of photos! and she wont accept a body double apparently. So if i start getting used to total strangers looking at my photo, maybe that will help? or not if nobody else ever reads this blog (which would be good for me!). Cheers for the comment! looks i will be with the folks for a while yet then!